Perhaps you've heard of Pewag's now famous "3012" chain. Well, that chain is a traction chain, and while it makes for a very strong and imposing security chain, it is prone to surface rust. It has no rust-prohibitive finish on it, because whatever surface rust accumulates really makes no difference in its service life as a traction chain. But since so many people have adopted 3012 as a security chain, Pewag realized it could be even better with an anti-corrosion finish. It took a few months, but now we finally have this new version of 1/2" security chain by Pewag. Same hardness, same toughness, now with an electro-galvanized finish. 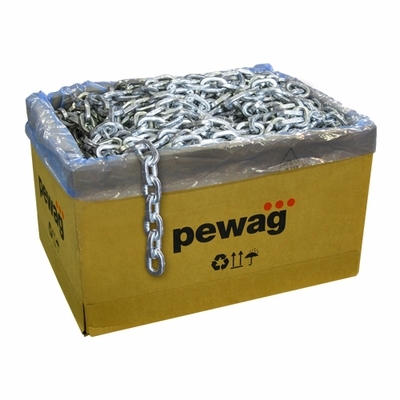 You may already be familiar with Pewag's 3/8" Square Case Hardened Security Chain--we literally sell a ton of it. This chain is very similar, except it's 2 mm larger (12 mm or 0.472" to be exact). This makes it beefier and even tougher to cut. But don't worry, if you still want the original 3012 1/2" Black Security Chain, we still offer it. Whether on YouTube (click on the Video tab), a website forum or just word of mouth, you may have already heard about this chain. It's in high demand and available to you right here from Westech Rigging Supply. Chain Hardness: 62 HRC Min. Is this chain the same as 3012? We get this question a lot. The answer is essentially, yes. The only significant difference is this new chain (#56847) has a galvanized finish and holds up better in the weather. Otherwise, the two chains are practically identical in terms of HRC and dimensions. Is each quantity of chain one linear foot or do I have to specify the footage I want elsewhere? I only need two feet of chain with the protective sleeve. The chain is sold by the linear foot, and if you want a two foot section, simply put a quantity of 2 in the box.� We only cut chain into pieces if requested by the customer. Will your chain fit into my padlock Abloy 362? If yes, I will place an order including the sleeve. 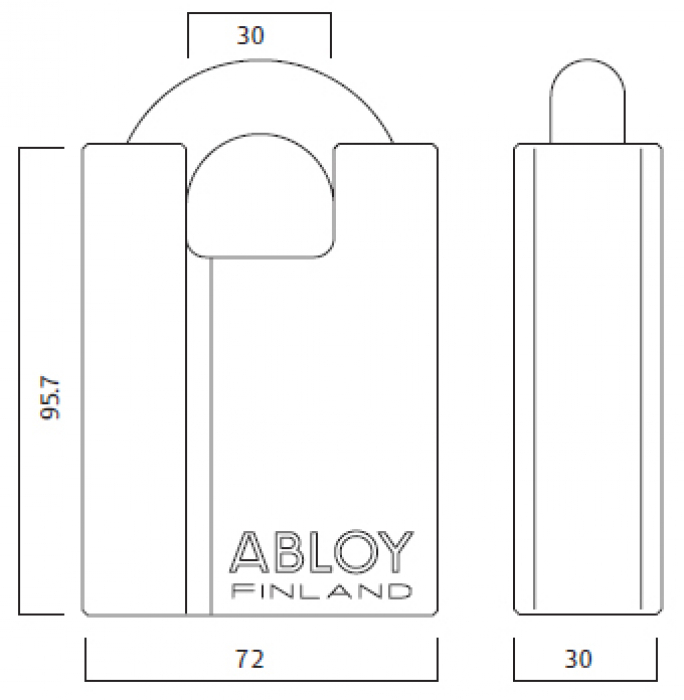 We do not stock or sell Abloy padlocks, so we cannot do a test fit.� However, from looking at dimensions on the Abloy website, it appears the chain will fit.� The opening is said to be 30mm and the chain is only 12mm, so two links of chain side by side should fit. Will this chain work with an Abus 37RK/80 lock? Although not offered for sale on our website, we do have one of these locks on hand, so we did a test fit. Unfortunately this chain will not fit because the design of this lock is for one single end link to nest inside the shackle and there is not room for the two 12mm links to sit side by side. It will, however, work with the Pewag 10mm Chain. Does the chafe sleeve cover the entire length of whatever length chain is ordered? For this particular chain, if you order the chafe sleeve as an option, then yes. We supply chafe sleeve to match the length of chain that you order. If you would rather order the chafe sleeve in a different length, you can do so here. What's the strength of this chain? Unlike lashing and lifting chains (such as Grade 70, Grade 100), security chain is not rated in terms of tensile strength, rather the emphasis is on hardness. This chain is surface hardened to 62 HRC. Its Breaking Strength will be several thousand pounds, but we do not have an exact number. We will reach out to Pewag and see if they can provide any further information, and if they can, we will post it here. Would I be able to fit a 16mm (5/8") shackle inside of a middle link or does the clearance not allow this placement? Yes, a 16mm or 5/8" diameter pin will fit through, as the inside dimensions per link are 0.69"W x 1.77"L (approximately). The description mentions the Surface Hardness is 62 HRC. Can you tell me what the inside Hardness is? The 12mm (1/2") size has a core hardness of 42 HRC and has held up extremely well--it's our #1 selling security chain. But, if you want a chain that is hardened all the way through, you may want to look at Peerless' 11mm Security Chain. It is hardened all the way through from 53-58 HRC. What is the chain's link opening width (for both the 1/2" and 3/8")? My lock shank is approx. 28mm x 28mm. 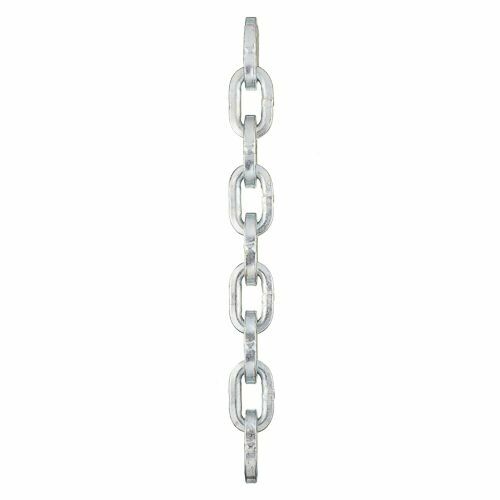 This chain has inside dimensions of 0.69"W x 1.77"L. The 3/8" Pewag Chain has inside dimensions of 0.63"W x 1.51"L. This information, as well as additional information, is available on the Specifications and Attachments tabs on each item's page. I need 4 feet of this chain. Do you sell in small lengths? Yes we sell by the linear foot. So if you want four feet, simply enter a quantity of 4 and add to cart. Did a bunch of research on security chains and after reviewing several companies, youtube videos, I decided to go for the Pewag 12mm chain. Amazon was of no help, so I googled where to buy this chain, and Westech Rigging Supply came up. I used this chain to secure a U-Haul trailer to my vehicle. ProsThe price was competitive and order was processed fast. Shipping was fast due my being in CA. I ordered this product on Monday and received it Thursday, same week. ConsThe only "con" is missing some helpful information on the product page. There should be somewhere stated on the product page that the chain is sold by linear feet and entering the number under the "Quantity" tab is equivalent to linear feet. Only wish I had more of it now, I suggest always buying extra. This is my second time ordering this same chain and sleeve from Westech Rigging Supply. The company ships fast and flawless. The product is stellar. If you want to protect something, this chain is going to be your best bet! It's the strongest chain I've ever seen! And although there is no chain on this planet that can withstand being cut with a blowtorch, this chain right here is the best you're going to buy anywhere. Solid security chain. I recommend this chain for security purposes over round Grade 43 chains every time. Impressively thick chain. I am guessing most impulsive thieves are going to take one look at it and just move onto something a bit easier to gnaw through. Make sure to pair it with an equally impressive lock. ProsObviously tough to even the most casual observer. ConsNot really a big con, but it's so obviously impressive someone may take a second look to see if whatever is locked up with it is worth the effort. Great service, the Pewag security chain is a MONSTER, WILL ORDER AGAIN!!! Heavy chain that will take minutes to cut with the grinder. Tough and solid that will break bolt cutters and hack saw teeth. Shipped to Australia. Excellent customer service. This is the real deal!! I couldn't be happier with this chain and chafe sleeve!! It's simply everything it is touted to be!! Westech's flawless service and communication is second to none! ProsThe quality of this product is worth every cent! Very substantial chain. I don't need to worry about losing my property from my truck. I purchased the 2-1/2" sleeve for the Laclede 13mm. Very tight fit. I recommend going a size up to 3-1/2". I'm happy with this purchase. ProsThe customer service at Westech is good and helpful. Price for this chain on here was almost half of what you can get it for other places. So it's a great deal for bike locks, container locks, etc. Pewag and Viro lock are everything they are purported to be and more. It's like the jewelry of the rigging world. Perfectly made, incredibly sturdy, and the customer service from Jared was above and beyond. Super fast shipping. Couldn't be happier. ProsEverything fits like a glove. ConsGot 43ft in 1/2", so for a small woman it is a little heavy to handle. When you get this chain you are telling burglars, I am not messing around, don't bother trying to cut me. Great product. ProsThis is the hardest chain on the market. ConsIt is bulky, so have a long necked lock to loop the width of this chain. What else could you need? This chain is pretty big, heavy duty and tells anyone considering the idea - don't even bother. Is it impossible to cut with bolt cutters? It pretty much is, but power tools I would reckon you could, but it would draw so much attention any thief wouldn't bother trying. -- Now I want more of this chain! I bought this chain after seeing several reviews that I saw. Based on the hardness rating I consider it to be the best chain available for securing my motorcycle. It's a substantial chain. Six feet weighs about 16 lbs. Cost with shipping was $113. Very satisfied with the purchase. Well worth the investment. This chain exceeds my expectations for toughness. I am using it as a security chain so only bought a small length. The fact that you can get it any length you need is a big advantage. While there are some specialized vendors that produce chains that exceed 12mm, I can't imagine needing a thicker chain (or enduring the extra weight). ConsUnlike purpose-built security chains this chain doesn't have a long link so you need a lock that can accommodate two links in the shackle. Chain is perfect securing my bike, trailer, and portable generator. Durability is incredible against methods of breakage. Also fits my 342 and 362 shackle guard model padlocks perfectly. Plus, Westech, made it a easy-breezy smooth transaction. ProsThe best accessible chain in the USA market. This chain is the smallest, easiest to carry chain that can not be cut with hand tools: See YouTube videos. It even requires 2 cuts, each cut with a power grinder, and each cut takes 3 times longer than when cutting standard large chain. Perfect for at home or on a bike carrier. The galvanized finish is beautiful. I purchased 12 ft of the Pewag 12mm chain, often used for security. It arrived quickly and was exactly as expected. A big, bad, "don't bother messing with me" chain. I used it on a recent trip to Palm Springs, to lock mountain bikes in the bed of my truck. We left the truck and spent hours walking around and having lunch, and I didn't worry once about the bikes. Over $10k worth of bikes, mind you. This chain is very good for peace of mind and nobody is going to use croppers to cut through it. It's big, with squared sides and has a hardness of 62 on the Rockwell hardness scale. The chain will break croppers. Only an angle grinder could get through the chain, and that is going to require 2 cuts at about a minute per cut. It'll be a very loud operation and create loads of sparks. The best chain in the world! Without question a great product.